This is a church of great interest, despite its Victorian makeover. But first, you will have to find it. There are fleeting glimpses on the road from Creeting St Mary; but, closer, the church is completely hidden by the trees that surround it. It lies at the end of a gravel track, about a third of a mile from the road; this is signposted, but the sign is also obscured by trees. A secret, hidden place; and yet, the sound of traffic tells us how close we are to the A14, and from the corner of the graveyard can be glimpsed the vast Dulux Paint factory complex at Stowmarket in the valley below. I'd originally been here on a day of high summer, when the trees were boiling with green. Coming back on a fresh spring day, I found the graveyard full of light. Two men with a Commonwealth War Graves Commission white van were busy beside the path, resetting a headstone. The tower is a pretty, Victorianised one from the 15th century. It bears obvious signs of substantial recent repairs, as does the porch below. The most striking thing about the outside of the church, though, is the series of knapped flint crosses on several of the buttresses. Each is about 90cm high, and there are five of them. However, seven other buttresses show signs of repair where the cross would have been, making twelve in all. Almost certainly, then, these were external consecration crosses, a rare survival. I'm sad to say that this church is not an easy one to visit, although the churchwarden I spoke to was very nice and helpful. Creeting St Peter is a church which is full of interest inside, but I wonder how many people ever see it? Perhaps the most remarkable feature of the church is on the north nave wall, the upper part of a great St Christopher. The colours are dulled, but the painting is highly detailed, although it is a little hard to decode at first, because St Christopher's head has been obscured by a roof beam, and the Christ child appears to be the central figure. Once you've seen that he is sitting on the shoulder of a larger figure, all is clear. The important survival is that this St Christopher retains its scrolled Latin inscription, which translates roughly as Whosoever regards this image shall feel no burden in his heart today. Much of the lower part of the image has been destroyed, but a detail survives in the bottom right hand corner of a mermaid holding a mirror and comb.The greatest fear of late medieval Christians was a sudden death, leaving their sins unconfessed. Intercessionary prayers were made to St Christopher for protection against such an eventuality, and this made him one of the most visible and significant parts of the 15th century economy of grace. Creeting St Peter church was derelict by the 18th century, so we have the Victorians to thank for its survival. There's is the roof, the furnishings, windows and sanctuary, and it is all well done. The east window is particularly interesting, as it predates the Victorian stained glass industry. It was made by a Rector of the church. It shows St Peter, so we may assume that this is one of the county's earliest responses to the Oxford Movement-inspired revival of interest in Catholic theology and sacramental art. The pulpit is slightly older than the other furnishings, and if you climb up into it you will see that it is heptagonal, the only one I know in Suffolk. Another curiosity is the font. 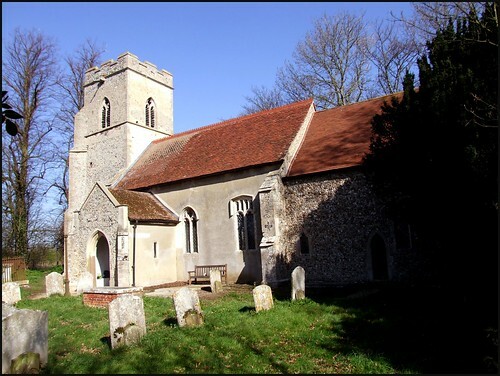 It is almost identical to that at Earl Stonham, four miles away; but unlike that one, this is in immaculate condition. Mortlock felt that it hadn't been recut, and the carving is certainly in a 15th century style. There seems to be nothing missing, except that the shields have no symbols on them. They don't seem to have been attacked by iconoclasts. Perhaps the font was never finished, but perhaps it is more likely that it is a clever Victorian copy of Earl Stonham's. Above the font, the 19th century gallery now contains the organ, which was rescued from a London church bombed in the Second World War. Three fish swirl on the altar hanging, which is either by the great Isobel Clover, or the work of one of her pupils. It enhances the feel of what is obviously a well-loved, well-used and looked-after church. St Peter is separated from its village by the four lanes of the A14, the roar of which can be heard from the churchyard. How has this happened? Simply, Creeting St Peter consists mainly of council houses and farm cottages, working people's houses. People like this do not get asked if they want a motorway at the bottom of the garden.